What we can see, is a slow, roughly linear expansion, which is the typical behavior of most smaller beta SE sites working actively on its graduation. However, this tendency was broken, roughly in the second half of 2017. Then, the count of the new questions got a huge increase, but also the count of the closed/deleted questions with it. This is highly atypical. The result is that the count of the questions who survived the reviews, didn't grow significantly. My impression is that from somewhere you got a gift, i.e. a large mass of content, questions, newcomers, and you rejected it. I am not sure if it was a wise decision, if your goal is to make your site successful. I'm quite sure this is 100% caused by spam posts. 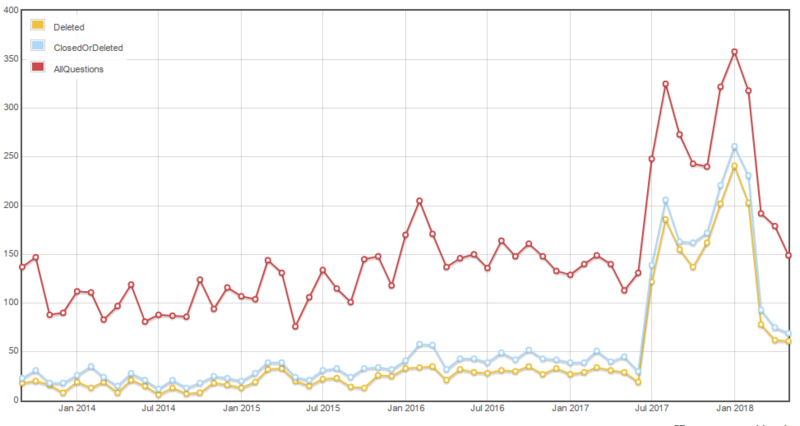 If you compare your graph with the one from the metasmoke dashboard, you'll see that the spam wave started in July 2017 (before that, Astronomy didn't see any spam at all) and has diminished (but didn't extinguish) since March 2018. It's possible to exclude posts which received spam flags from the statistics, but it'll require rewriting the query. Not the answer you're looking for? Browse other questions tagged discussion site-improvement strategy .